Chapter 1: What is Nutritional Anthropology? This book is the culmination of a long journey. Many people have helped me along the way and it is my pleasure here to single out some of them for special mention. An early, and essential, influence was that of my quietly determined, selfless grandmother, Anna. At her knee, we learned to respect our bodies and to keep close to nature. She taught us to think critically about what we put in our mouths and to get plenty of fresh air, exercise, and sunshine. She pluckily challenged the dietary doctrines of her day. She was decades ahead of her time and, as pioneers do, had to suffer much uncomprehending banter. Thanks to her influence in my childhood over half a century ago, I have lived a life brimming with good health. If I have seen further than most, then it is only because, as a small boy, I used to sit on Anna’s shoulders. She would be immensely proud. My insights would not have been possible without the peculiarities of upbringing that created in me an untamed questioning, a delight in discovery, and a distaste for humbug. Thank you, then, to my undoctrinaire parents who taught me to be honest to the evidence and to hold fast in the teeth of dogma-driven opposition. I am indebted to my wife Nicole. This book had a long and difficult gestation and she was always there with her encouragement and support. Like the faery’s child, she found me the manna dew which sustained and nourished my firmness of purpose. Nicole vetted the early proofs: thanks to her I made major improvements to comprehensibility and readability. With the enthusiasm of the convert, she works tirelessly to publicize the life-saving knowledge contained in these pages. 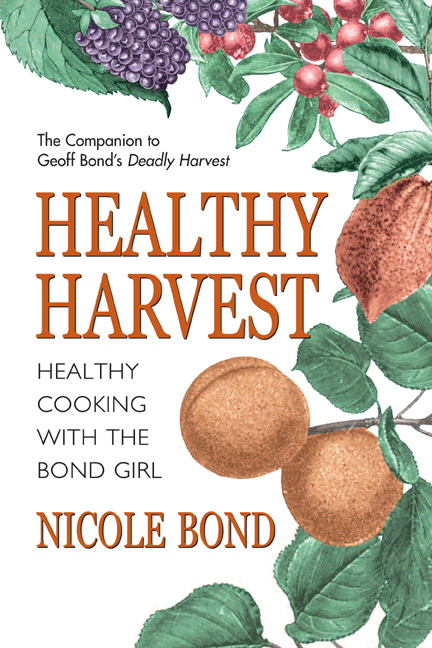 With her French background, Nicole is an enthusiastic cook. She has delighted in developing ways of preparing delicious food in conformity with the Savanna Model. These she has crystallized into her cookbook, Healthy Harvest. The reader will find a sample of these recipes in chapter 7. This book would not have been possible without the confidence of my publisher, Rudy Shur, of Square One Publishers. In his words, “You have a great rough diamond, we have to release the brilliant stone inside.” Thanks to his patient guidance, we transformed the ugly duckling into a swan. Thanks also to my editor, John Anderson, who shaped the final drafts and refrained from excising too many of my flights of fancy. I am indebted to the many expert reviewers whose opinions, encouragement, and advice have improved the relevance, usefulness, and scientific accuracy of the text: Rita Stec, M.D., president of the Walter T. Stec Memorial Foundation of Indian Wells, California; Elber S. Camacho, M.D., medical director of the Comprehensive Cancer Center, in Palm Springs; Dr. Günter Nöll, of Vienna, Austria, biochemist and authority on edible wild plants; and Caroline Mansfield, N.D., director of The Naturopathic Clinic, in London. If, in spite of their efforts, there remain any deficiencies or differences of opinion, then these are mine alone. Many visionaries helped me on my way in the early days: Christopher Brown MD who wrote the excellent foreword to my first book, Joe Schuchert of Kelso Corporation who, with Emmanuel Kampouris as chairman of American Standard, brought my ideas to their workforce, and Steven Gundry MD, Medical Director of The International Heart Institute of Palm Springs. Many readers and followers have encouraged me with their enthusiasm over the years. It is invidious to single out any one of them. However, I must mention Dr. James Melton, visionary and speaker, for his sage guidance -- and Frédéric and Jeanne Bouvet who, persuaded from the very earliest days, produced the first child, Alexandre, using my precepts all the way from inception, through pregnancy to upbringing. If you are one of the many meritorious contributors whom it has not been possible to cite, just know that you are, like HenryV’s unsung heroes, “freshly remember’d” and that your influence lives on in this work. To all of you, and to all of those as yet unsung, my heartfelt thanks. A zookeeper puts signs in front of the cages saying, “Please do not feed the animals.” Have you ever thought about that? If you feed lions on popcorn or gorillas on pizza, they get sick and die. The zookeeper knows that there is a particular feeding pattern that is right for each of these creatures. We now realize that there is a particular feeding pattern appropriate for human creatures as well. A new science has come into being to explore this fascinating subject: nutritional anthropology. It is the spellbinding story about what it means to be human—in nutritional terms. It provides an extraordinarily powerful understanding of how, by eating in harmony with the way our bodies are designed, we can rejoice in the best possible health and relish the prospect of a long life. We accept that lions and gorillas have bodies, digestive systems, and feeding patterns that are adapted to the environment in which they live. Lions, who live by catching and eating fleet-footed antelope, have razor-sharp claws, needle teeth, and powerful stomach acids. Gorillas, who live by chomping through vast quantities of vegetation, have massive molars and long colons. Lions’ bodies are designed to work on the food that lions eat and gorillas’ bodies are designed to work on the food that gorillas eat. Yet we imagine, incorrectly, that humans are made to eat anything. What feeding environment are human bodies designed for? Nutritional anthropology shows that there is a very precise specification for the human diet, developed by our human ancestors over millennia, and our bodies are designed to work according to those instructions and no others. It is an adventure story, stretching across the globe and into the distant past, to discover what humans were designed to eat. The past is the future: modern-day humans have changed very little, genetically speaking, and we are still living in bodies that nature designed to thrive in that far off time. Examining our ancestors’ way of life provides powerful clues to how we should be living today. These remarkable insights show how, in many surprising and unsuspected ways, we can make critical, life-transforming adjustments. The way humans have been eating and living for many thousands of years has not been ideal. In this book, you will learn how we discovered this and come to understand what we can do to improve and enrich our own lives right now. Our first goal is to open your mind to a whole new way of thinking about the fuel that your body needs. Once this reality is accepted, we can move forward to learning how to practice this way of feeding in today’s world. The news is good—we live in a society where there is a huge variety and abundance of food available from all corners of the globe at any time of the year. We just have to learn how to choose wisely. One of the most troubling aspects of our busy lives is the constant bombardment of conflicting messages directed at us by the health and food industries. In this book, we show you the way to peace of mind. The insights of nutritional anthropology empower you to judge for yourself. They bring clarity to the confusion and allow you to select with confidence which claims to accept and which to reject. After all, our ancestors knew they were living in a dangerous, treacherous, and unpredictable jungle. They had the skills to survive: they knew which mushrooms were poisonous and which berries were safe. This book can help teach you the skills to survive in today’s supermarket jungle. The insights of nutritional anthropology get at the root causes of the “diseases of civilization”: cancer, heart disease, stroke, diabetes, obesity, arthritis, osteoporosis, Alzheimer’s disease, and many more. These diseases are not inevitable, they are optional. These are lifestyle diseases, which can be avoided and put into remission. By understanding the principles of nutritional anthropology and eating in accordance with our naturally adapted lifestyle, you will be able to choose the right foods to eat and know why. You can improve your health to be better able to combat any disease and live longer. Your body will find its natural ideal weight, either losing or gaining according to its needs. You will be able to take control of your eating habits and thus your life. These are powerful claims, but as a scientist I am not given to flights of fancy or guesswork. All the information in this book is based on evidence-driven science. These insights are new, because the various pieces of the puzzle have only recently been put together. For example, peering deep into our DNA is one of the exciting new tools for unlocking the secrets of our genetic heritage. And there are many other fields that are yielding fascinating new insights about how human beings are “designed” to live. This book gathers this scattered, cutting-edge information and synthesizes it into a coherent whole. But this is not just theory—the ideas work. Over the past decade, thousands of individuals have been empowered by this information. I have personally worked with many of them to understand the nature of disease, to take control of their eating habits, and to help them live a healthier lifestyle. Many people’s lives have been transformed by the insights of nutritional anthropology. The first part of the book explains nutritional anthropology—how we know what it means to be a human being, particularly in nutritional terms. We highlight the consequences of our divergence from the ideal eating pattern. The middle part of the book deals with how humans moved away from our naturally adapted environment, feeding patterns, and lifestyle and looks at the science supporting our claims. Then, based on these insights, we develop an “Owner’s Manual” for how we should be feeding ourselves today and show you how to put it into action today. Finally, we present an overview of specific diseases and how these relate to the ways we eat and live. • Chapter 1 describes the remarkable discoveries of nutritional anthropology: about where we came from and how our ancestors made their living there. • Chapter 2 describes how, over many millennia, more and more foods have become part of our diets (not always for the best) and describes how governments, somewhat arbitrarily, provide dietary guidelines. • Chapter 3 reviews how we eat today and hints at the surprising health consequences. • Chapters 4 and 5 go backstage to look at the science behind these assertions, bringing in evidence from other areas of scientific enquiry that satisfyingly complete the picture. • In chapter 6, we pull all the pieces of evidence together to define the “Owners Manual,” the naturally adapted eating pattern for the human species. • Chapter 7 sets out the route map for feeding ourselves in today’s world. It gives practical advice, strategies for different situations, and a step-by-step approach for easily putting the principles into practice. • Chapter 8 shows how we can make adjustments in our lives—to bring them in line with our naturally adapted lifestyle—that can help our well-being. Stress, exercise, spirituality, kinships, family relationships, differences between the sexes, parenting, and other topics are explored. • Chapter 9 looks at the connection among what we eat, lifestyle factors, and the “diseases of civilization.” Returning to our naturally adapted feeding patterns can greatly improve our health and well-being. This book’s fusion of healthy eating with healthy thinking could not be more important, dealing as it does with the absolute fundamentals of human nature. It feels good to know at last that you have a coherent and focused road map for humbug-free bodily nutrition. It is a relief to be clear about where you have to go, and you’ll feel better about yourself for taking control of your destiny. You will find the secret to what it means to be a human being living in close connection with our natural lifestyle. Everyone can use these ideas to enhance their image, inside and out. It contains the easy-to-learn skills of how to harmonize your eating with human genetic programming. That is the idea of the “Bond Effect”—that we can make adjustments to our ways of eating, our ways of thinking, and our lifestyle so that they coincide as closely as possible with our inherited natural traits, offering the key to a healthy and harmonious life.